PLEASE NOTE: The nest was predated by foxes over the weekend and the watchpoint is now closed. 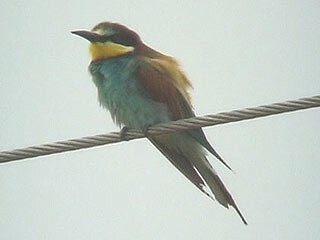 A pair of Bee-eaters, one of Europe's most colourful birds, have once again attempted breeding in the UK. Many will remember the recent successful breeding in Co. Durham at Bishop Middleham in 2002 when two young fledged successfully. 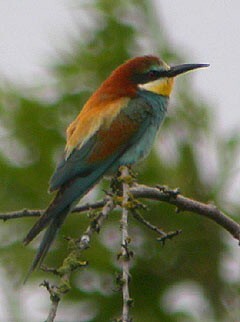 Well, if you missed that opportunity to see breeding kaleidoscopic Bee-eaters in the UK, you now have another opportunity. At the weekend the RSPB released news of a pair breeding at Hampton Bishop (c. SO550381&a=y), 2 miles southeast of Hereford. The birds are feeding chicks within a nest along the River Wye. 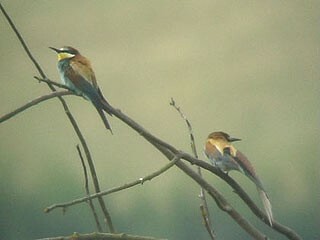 An RSPB "Aren't Birds Brilliant" viewing scheme is in operation and will last for several weeks. 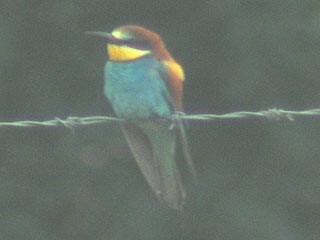 To access the 2005 Bee-eater watchpoint: on the B4224 through Hampton Bishop village, drive to the "Bunch of Carrots" public house and then carefully follow signs to access a small lane running behind the pub and alongside the River Wye for ¼ mile in a southwesterly direction until reaching Colcombe Coach Farm. Park ONLY in the signed stubble field car park and do not park in Hampton Bishop village. Access and parking have been kindly provided by the owners of Colcombe Coach Farm (please see footnotes for latest parking arrangements during recent wet weather). A £2 donation per car is invited, which will be shared between RSPB and the farmer. It's common sense, but please watch ONLY from the designated watchpoint to avoid undue disturbance to the nesting birds. 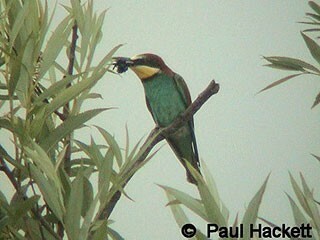 This is only the 4th occasion that Bee-eaters have bred in the UK. 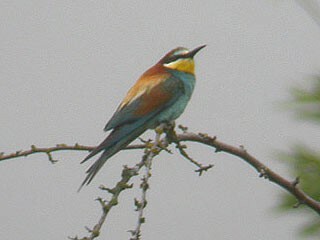 Prior to 2002 it was nearly 50 years since Bee-eaters were last recorded breeding in the UK in 1955, when two pairs nesting in a sand-pit in Sussex raised seven young. Before that, the only other known nesting attempt was in Scotland in 1920. 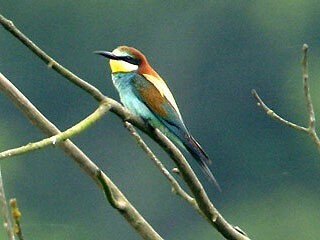 The RSPB is providing binoculars and telescopes at the viewpoint to ensure that everyone gets a chance to see the Bee-eaters. There is also 24-hour surveillance of the nesting site to ensure the birds are not disturbed. RSPB UPDATE: Unfortunately, the stubble field car park close to the RSPB marquee has fallen victim to the rain and has been closed for the time being. Thanks to the Bunch of Carrots pub at the end of the lane, temporary parking for visitors has been arranged at the overflow car park at the back of the pub. Please follow all on site instructions.